“But you would not listen to me,” says the LORD. “You made me furious by worshiping your idols, bringing on yourselves all the disasters you now suffer. The verse follows up on the previous one, in which God warns, “do not pursue other gods and serve them and bow down to them, and do not anger me with the works of your hands, and I will not harm you.” The repetition in verses 25:6 and 25:7 of “anger,” “works of your hands” and “harm” tie the two together. It seems to me that at the very least a translation of these two verses should (a) convey the point of the passage, and only the point of the passage; and (b) preserve the connection between the two verses. The NLT fails (a), because the original verses do not say “bringing on yourselves.” Does the original text imply that the false-god worshippers have brought about their own punishment? Maybe, if you think that failing to heed a warning is the same as bringing something on yourself. But even so, turning an implication of the text into the text is a mistake. The NLT also misses the connection with the previous verse: “Do not make me angry by worshiping the idols you have made. Then I will not harm you” (Jer 25:6, NLT). The switch from “angry” to “furious” for the same Hebrew word is misleading. The NLT rewrite of 25:6 lacks the parellism of the original, but I think it still conveys the similarity of angering God and worshipping idols. On the other hand, “do you no hurt” and “to your own hurt” are barely English. The ESV changes “hurt” to “harm,” updating the English a bit. The NRSV does the same. The NAB fixes verse 25:6 with “bring evil upon you,” but then keeps “to your own harm” in the following verse, breaking the connection between the two. 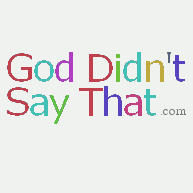 The NIV fixes verse 25:6 with “then I will not harm you” and follows up with “and you have brought harm to yourselves,” again shifting the focus a little. Though there are some interesting translation issues in Jeremiah 25:6-7, it’s among the more straightforward passages, and I’m a little surprised how far some versions stray in translating it. We just saw a case of an attempt to translate the pragmatics of a text instead of the text itself. In general, a text will have a variety of implications, morals, allusions, etc. I think that a good translation of the text will match the original with a translation that has similar implications, morals, allusions, and so forth. 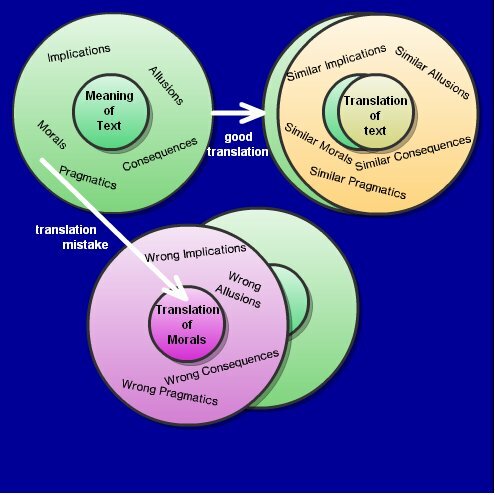 Sometimes, however, translators are tempted to focus on one aspect of the text; then they translate that aspect instead of the text. The chart at the right depicts the two approaches. I think that the NIV, NLT, NCV, CEV, and The Message get it wrong. Each of those versions translated something related to the text instead of the text itself. Presumably, the translators for some of these versions decided that it’s just not true that the Law “is” the Golden Rule, but if so, what they missed is that it’s equally (un)true in Greek as it is in translation. Perhaps the point of the passage is that the golden rule sums up the Law and the Prophets, but again, even if that’s true, “sums up” doesn’t seem like the right translation, because I don’t think it’s the job of the translation to jump from the text to its point for us. It seems to me that when the lines between commentary and translation are blurred, it does a disservice to both.